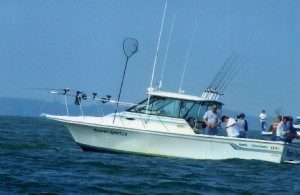 Charter Fishing on Lake Erie, Port Clinton, Marblehead - Trophy Hunter Charter Services, Inc.
Are you a fan of one of the oldest and most loved sports? If so, then welcome to Trophy Hunter Charters. We are your premier fishing charter service on Lake Erie in Port Clinton,Ohio. Our vacationland location puts us in the heart of island scenery and spectacular walleye, smallmouth bass and yellow perch fishing. Our personal fishing guide will take you to the western basin and portions of the central basin on Lake Erie. We fish in U.S. and Canadian waters. 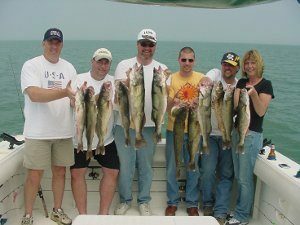 We can take you to the best spots to have the most successful fishing trip on Lake Erie. Port Clinton is the walleye capital of the world! Your guide will work hard to provide you with the best chartered fishing trip of a lifetime! We are central to all of the prime fishing and island areas; we are close to Canada. 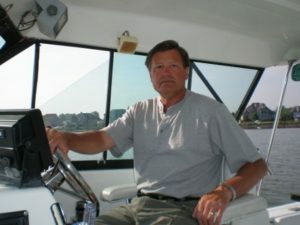 You get to fish with a captain with over 30 years of experience. The boat is maintained and is fully equipped, and so much more. We can customize your charter boat trip to meet your individual needs and preferences. Currently, there are many guided fishing trips available. Most charters are 8 hours long but we do offer some half-day trips, which would be 5 hours. We even offer you late season night fishing charters. We welcome you to bring friends and family along. A lot of thought, effort and care are put into the fishing charters we provide. We don’t want you to leave feeling unsatisfied. We have quality equipment and expert knowledge of Lake Erie. You won’t be disappointed. Contact Us today for more information on how you can reserve your next chartered fishing trip!